Creamy Pumpkin Pasta. I shared a recipe on my Facebook page the other day for a Pumpkin Pasta from Eat Good 4 Life. It looked so good I knew I had to try and come up with a vegan and gluten free version of her pumpkin pasta recipe. The addition of coconut milk and cayenne in my pumpkin pasta recipe really makes it special. Pumpkin is so great in savory recipes, not just in sweet recipes. I used brown rice pasta in my healthy pumpkin pasta recipe to make it gluten free. This hearty pumpkin pasta recipe is very inexpensive to make and also very filling. A creamy and delicious pasta that can be made in under 20 minutes. Combine all the ingredients except the pasta in a blender and blend until smooth. Pour sauce over cooked pasta and serve immediately or refrigerate for later. Should last for about a week in the fridge. 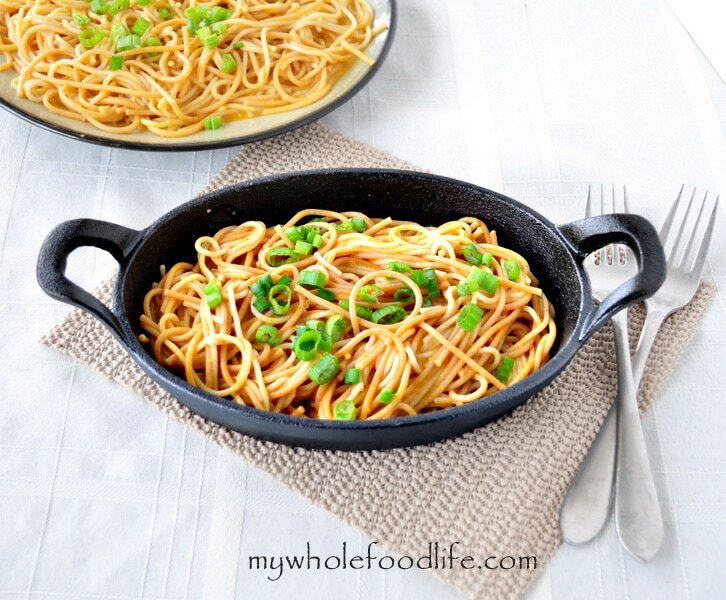 You can add some chopped green onions on top for garnish and a bit of an onion flavor. Thank you so much for your blog. I have cooked and enjoyed many of your recipes. Have a wonderful holiday. Wondering if this tastes coconutty? It didn't taste coconutty to me. You can always sub the coconut milk for almond milk, but it will have a slightly less creamy texture. This sounds delicious!! Would it work if I blended silken tofu instead of the coconut milk or almond milk? I think that could work. Please report the results! I would love to know. This was delicious! Creamy with 1 cup of almond milk in it. Super spicy! I even went down to 1/4 tsp cayenne. Whew! But I am a weeny when it comes to spicy things. Thanks for the recipe! I 'm sorry I thought you were going to put the pumkin in the pasta maybe next time right? We poured the pumpkin over the hot pasta. Loved this! I did add about a half cup of the pasta water to thin it a tiny bit - then added lean turkey breast chunks and peas to it to make a whole meal. Yummy! Is this dish served warm or cold? Would you reheat leftovers? Looks delicious!! Thanks! We served it over warm pasta. You can use a microwave to gently re-heat it or just re-heat in a saucepan. You may need to add a tiny bit of milk when you re-heat it. The sauce can tend to thicken once stored. My husband and I ate this last night and we both had the same opinion: It was weird but not in a bad way, it didn't leave us wanting more. It was good, but I wouldn't make it again. I have to agree.....I just made this for tonight's dinner and I'm not at all excited about it. I probably would mix some veggies in it next time: red/yellow peppers, sugar snap peas, pearl onions, and personally, if I wasn't feeding non spice loving people, I'd throw some red pepper flakes in. I appreciate this blog and all the recipes. Sometimes they strike your fancy and sometimes they don't, but you won't know until you try. Peace and well being. I am sorry it did not meet your expectations. I understand not every recipe will be a hit with everyone. Thank you for all the fabulous recipes. This one does not disappoint! Delicious as always. Yay!! You are welcome Pat.